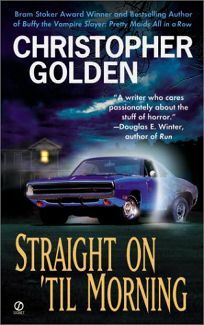 Stoker Award winner Golden's (Buffy the Vampire Slayer: Pretty Maids All in a Row; Strangewood) dramatic and funny coming-of-age story set in the summer of 1981 stumbles off to a slow start as he introduces 13-year-old Kevin Murphy and his delinquent friends. Thankfully, the narrative kicks into high gear midway through, evolving into a horrific and ultimately sorrowful thriller. Kevin has obsessed over his 15-year-old neighbor, Nikki French, for years, and he's crestfallen when she meets and falls in love with a strange older boy named Peter Starling. An avid reader of comic books and fantastic stories, Kevin believes there's something not quite right about Peter. His suspicions are confirmed when, in an abrupt plot shift, Peter kidnaps Nikki and whisks her to Neverland, a grotesque place engaged in civil war and inhabited by slimy seallike creatures, behemoth monsters and others like Peter who are members of a race just slightly less than human. Having witnessed Nikki's late-night abduction, Kevin decides to rescue her and convinces his brother and two foulmouthed friends to journey with him ""second to the right... and straight on till morning"" the last words Kevin heard Peter utter to Nikki. A bizarre combination of The Wonder Years TV series and The Lost Boys film, this fantastic tale entertains, but a hurried conclusion may leave readers in the dark. Agent, Lori Perkins. (Apr.) FYI: On April 10, Signet will issue this title as a mass market paperback ($6.99 0-45120276-7).